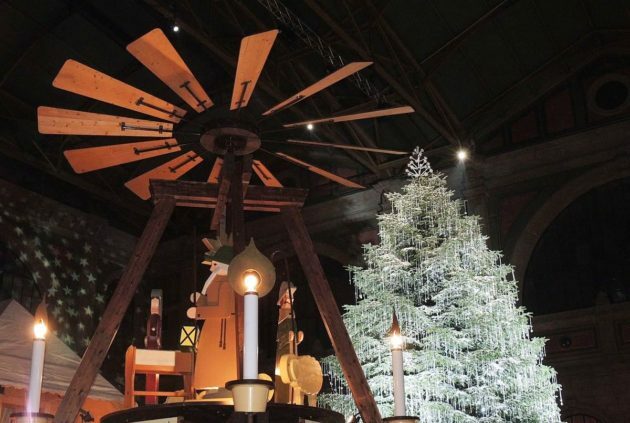 With just seventeen full shopping days left until Christmas, today we are focusing our attention on Great Gifts for Him at World of Watches. No matter if you are shopping for your husband, boyfriend, dad, son, brother, uncle or special friends, there are over 2,600 men’s styles from by today’s most sought-after watchmakers, including Breitling, Corum, Invicta, U-Boat, Bulova, Rolex, Swiss Legend, Omega, Red Line, TAG Heuer, Lucien Piccard, Raymond Weil, Luminox, Tissot, Porsche Design, Eterna and more. Whether it’s a prestigious high-end timepiece, a depth defying deep-sea diver’s model, an action-packed pilot’s chronograph or a rugged and adventurous sport watch, you’re certain to find the perfect gift you are looking for in every price range. 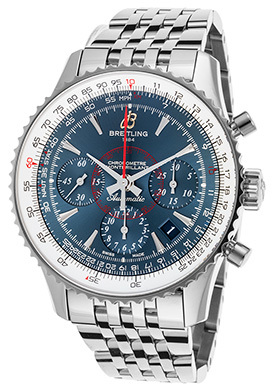 The Breitling Montbrillant Limited-Edition Chronograph is an extraordinary holiday gift choice for men. This impeccably crafted Swiss-made automatic men’s watch has been awarded official Chronometer certification from the esteemed COSC (Official Swiss Chronometer Test Institute). The signature contoured round case and matching vertical link bracelet in premium grade stainless steel are highly polished to a mirror-bright glow. The bi-directional rotating slide-rule bezel with a coin edge rim in polished stainless steel frames the blue dial with three sub-dials, polished silver-tone sword hands and hour markers. 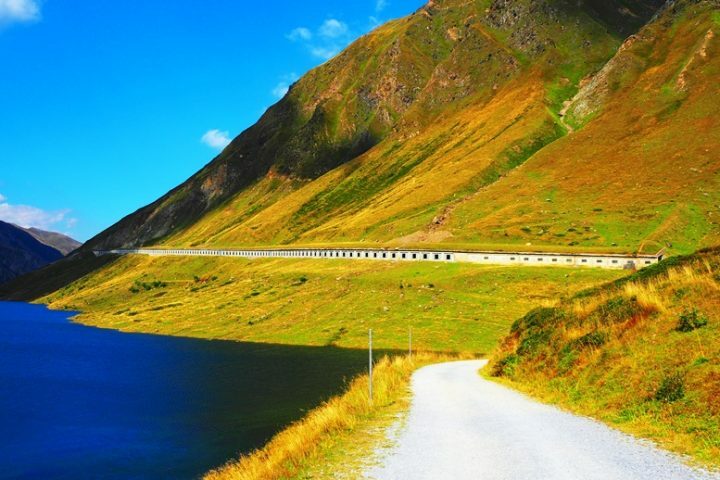 Features include an automatic date window, small-second, 30-minute and 12-hour countdown timers. Additional features include a 70-hour power reserve, along with a scratch resistant sapphire crystal above the dial and water-resistance to 30 meters or 100 feet. The Breitling Montbrillant Limited-Edition men’s chronograph is 47mm in diameter and 14mm thick. 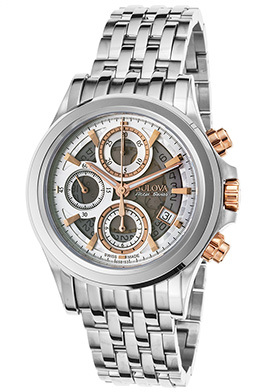 The Bulova Accu-Swiss Kirkwood Automatic Chronograph is another excellent gift choice for the discerning man. This distinguished, Swiss-made automatic men’s watch features the contoured round case in polished premium grade stainless steel, presented on a handsome vertical link bracelet in brushed and polished stainless steel. Lustrous rose gold-tone stainless steel crown and push-pieces add striking contrast. The integrated, stationary polished stainless steel bezel surrounds the semi-skeleton dial with a white outer dial, three sub-dials, luminous rose gold-tone hands and rose gold-tone hour markers. Features include an automatic date window, small-second, 30-minute and 12-hour registers. An exhibition skeleton case back lets you see the intricate Swiss-made automatic movement inside. Additional features include a scratch resistant sapphire crystal above the dial, along with water-resistance to 100 meters or 330 feet. The Bulova Accu-Swiss Kirkwood Automatic men’s chronograph is 42mm in diameter and 16mm thick. Invicta is one of the most popular watch brands at World of Watches and the Invicta Bolt Zeus Reserve Chronograph is certain to impress. This robust and masculine Swiss-made men’s watch makes a bold statement on the wrist with a stout contoured case in brushed and polished 18K yellow gold plate features contrasting black braided rope trim accents on the case side. The high-performance black polyurethane strap with polished 18K yellow gold-plated accents add to the stylish good looks. The unidirectional rotating bezel in polished 18K gold-plated is accented with braided black metal roped trim detail and engraved markers. The concave black dial has a carbon fiber center dial, three sub-dials, luminous skeleton hands and luminous cabochon dot hour markers. Features include an automatic date window, 1/10th of a second, small-second and 30-minute countdown timers. Additional features include premium Swiss-made quartz movement inside, a scratch resistant Flame Fusion crystal above the dial, along with a locking screw-down crown and case back for water-resistance to 200 meters or 660 feet. 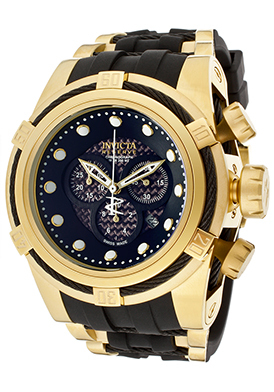 The Invicta Bolt Zeus Reserve Chronograph is 52mm in diameter and 21mm thick. The Tissot T-Sport Titanium Chronograph is an especially good gift choice for men with wristwatch weight and metal allergy issues. This outstanding Swiss-made men’s timepiece features a case and matching bracelet crafted in ultra-light, ultra-durable titanium with a smooth brushed finish. Titanium is not only hypoallergenic and ideal for individuals allergic to stainless steel or gold, it is also considerably lighter in weight than the other metals as well and extremely comfortable to wear on the wrist for long durations of time. The integrated stationary bezel surrounds the blue dial with 1/10th of a second, small-second and 30-minute sub-dials, an automatic date window, luminous skeleton hands and baton hour markers. Features include a scratch resistant sapphire crystal above the dial, quality Swiss-made quartz movement inside and water-resistance to 100 meters or 330 feet. 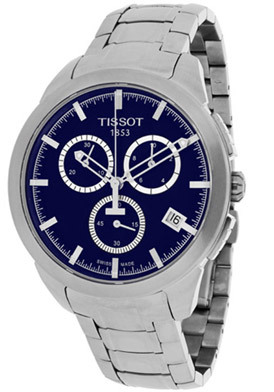 The Tissot T-Sport Titanium Chronograph is 43mm in diameter and 11mm thick. You don’t have to look any further than the Swiss Legend Hunter Chronograph for a Swiss-made men’s watch big on performance and character, yet easy on your wallet. The bold contemporary design is filled with stamina and style. The generously oversized 52mm diameter case in brushed premium grade stainless steel is presented on an attractive black silicone strap with decorative metal trim. The unidirectional rotating bezel with raised markers has a distinctive coin-edge rim. The multi-layered dial has three sub-dials, an automatic date window, luminous hands and hour markers. A locking screw-down crown and case back for water-resistance to 100 meters or 330 feet. Additional features include premium Swiss-made quartz movement inside and a scratch resistant Sapphitek crystal above the dial. 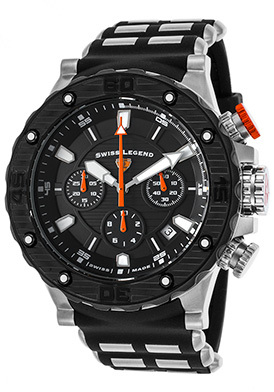 The Swiss Legend Hunter men’s chronograph is 50 in diameter and 17mm thick. The Luminox SXC 5020 Space Series GMT Men’s Watch is another outstanding gift selection. This dynamic Swiss-made men’s watch features virile masculine design and innovative craftsmanship. The incredibly durable, yet lightweight black polycarbonate case is both incredibly strong and lightweight. Polycarbonate, a man-made plastic is after all the same material used in bullet-proof vests. The matching black silicone strap adds to the sleek contemporary lines. The directional rotating black bezel with screened markers surrounds the black dial with luminous hands, a red luminous GMT hand, along with luminous baton and Arabic numeral hour markers. A window at the 3 o’clock hour reveals the automatic date calendar. Features include quality quartz movement inside for precise time-keeping accuracy and water-resistance to 200 meters or 660 feet. The Luminox SXC 5020 Space Series GMT men’s watch is 46mm in diameter and 16mm thick.